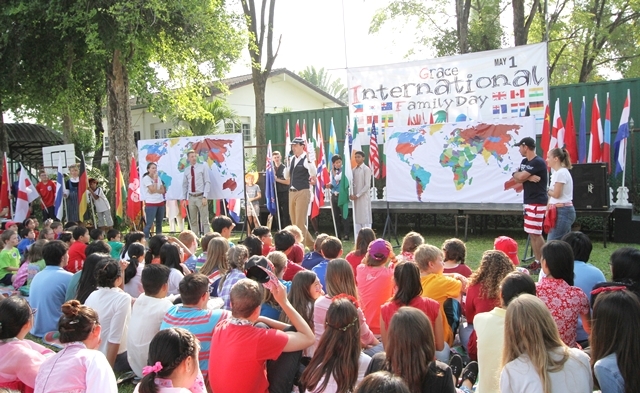 August 2015 - The Webb Family Serving at Grace International School Chiang Mai. This week I assigned my class the task of writing a blog in order to link the movie ‘Divergent’ to the Christian gospel. Here is my attempt. All the five factions gather to witness the choosing ceremony. The factions divide into God given characteristics. Tris and her brother Caleb are born into an Abnegation family. 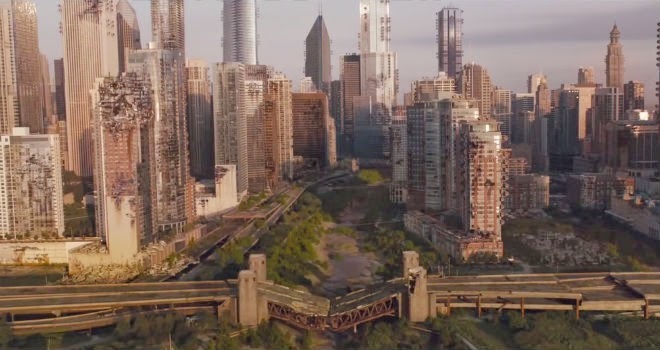 Abnegation are the selfless faction that serve the faction-less poor in the city. They reject vanity, dress in drab plain clothes and are regarded by the other factions as ‘ stiffs.’ On the opposite extreme are ‘Dauntless.’ This courageous faction police the city. They embrace risk but are reckless and end up causing danger. Amity love peace and live a simple life but they are unprepared to stand up and fight when it is needed. Candour love transparency but tend to speak the truth in inappropriate ways. Erudite are the scientists, the researchers and philosophers but they end up using their knowledge for evil means. Divergent, like a modern Lord of the Flies, elucidates the biblical doctrine of human depravity. It is human sin that is to blame for all the ills in society and humans cannot fix it. Tris chose to embrace the ‘ Dauntless’ faction, throwing off the shackles of her legalistic past. But her test results had proven inconclusive. Her proclivity was to several factions. She experienced the teenager’s worst nightmare. She did not fit in. As a result she is targeted by administrators of the society. Yet Tris herself, and her love interest ‘Four’ are flawed individuals who make rash choices and find themselves unable to overcome murderous forces that are too strong for them. Divergent points us by way of contrast to a world we long for which is free of manipulation, injustice, violence greed, perversion and evil. Our aspirations for this kind of world are only met in the truly Divergent saviour Jesus Christ. In the greatest act of dauntless abnegation, he confronted the hypocritical religious elite and died in order to pay the penalty that, warped and perverted humanity, deserves to pay. Because he rose again, the last unfulfilled prophesies of the bible state that Jesus will return in order to redeem this fallen world to effect its complete redemption and as JR Tolkein wrote in Lord of the Rings: ‘ make everything sad become untrue.’ Only He can do it. My first week back in Chiang Mai has involved a staff induction where we start each morning at 7.30am for worship before getting down to the business of planning lessons and building community between us as teachers. In my department of three, we have a Brit, an Italian and a guy from north Dakota. Across the school, and in our community, we have people from many different backgrounds and almost every denomination you can think of. Its important we have started the term with worship each day. Working here involves not just teaching but doing life together. Its not easy because human nature is to be selfish. I am much better at talking about community than practising it. Yet worshipping together at 7.30am has been just what we need to start each day. When the church began , a multi-cultural group, not unlike ours, came together every day and in their homes they devoted themselves to teaching, the fellowship, breaking of bread and prayer. These people had come to Jerusalem from Parthia, Persia, Mesopotamia, Judea, Cappadocia, Pontus and Asia. (Acts 2:9-10) There were also people from Libya, Egypt, Crete, Arabia and elsewhere. Some people say that religion is a matter of temperament: some people like to be religious and go to meetings. Others say that religion is a matter of culture. If you are from Italy you are Catholic, If you are from Thailand you are Buddhist, if you are from Scotland you are Presbyterian etc. Yet the early church community, like ours, contained people with a plethora of different temperaments and backgrounds. The appeal of Christianity and the reason for its early spread was that its message reached out to Romans, Jews and Barbarians. Churches contained slaves and masters and men and women were equally involved. Christianity means that you have a close connection with people you would have previously despised. The account in Acts chapter 2 describes how the earliest Christians shared their financial burdens and devoted themselves to one another in community. Christian community reflects the ultimate harmony that exists between the persons of God the Father, God the Son and God the Holy Spirit. Though inexplicable, the trinity is the source of all harmony. Christianity is the religion that produces the most beautiful music, whereas religions without a God who is relational and loving in his essence submit but do not sing. Worship is the dynamite which led to the generosity, mercy ministries and evangelism of the early church. It remains the dynamite which fuels our work today. Why is this? CS Lewis: makes the point that enjoyment itself is incomplete until it is expressed. My enjoyment of England’s Ashes victory is consummated by my sharing it with my British neighbour. 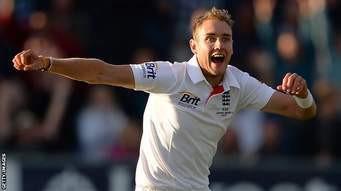 Stuart Broad’s spell was all the more enjoyable because I watched it online with my family and with my British neighbours. We revelled in it and enjoyed it much more because we were able to see it together. The more beautiful the object the more that object surges and has to be expressed in praise. God demands to be praised. Yet our worship each morning at 7.30am was not demanded of us by the program. It was the event in the day we all wanted to be at. Our community is not like when communists get together or republicans (often because of their predjudices) We get together to praise the one who was broken because we know we are broken. We evangelise because we see him as an absolute beauty and we have to celebrate that. We also have to be sensitive. Ann doesn’t care about Broad’s 8 for 15. But its still good news and it still definitely happened. Christ died for our sins and rose again to conquer death and enable us to be justified. It definitely happened and its great news. But what creates community in our context is praising him for his brokenness for us. Our worship helps us break our barriers of political persuasion and race and temperament and class and work towards being a true community. 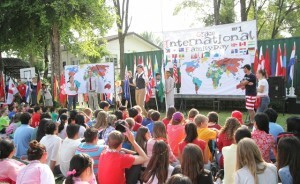 Students at a middle school assembly.